A 2012 study of enormous proportions just concluded that diet is THE number one killer in the world! It is the most comprehensive and systematic analysis of causes of death undertaken to date, involving nearly 500 researchers from more than 300 institutions in 50 countries, and starting with almost 100,000 data sources. Diseases of all sorts, from diabetes and heart disease to cancer are all caused by a lack of clean fruit and vegetables in our diets. One way plants protect us may be their antiplatelet effects. Platelets are what trigger the blood clots that cause heart attacks and most strokes. And beyond their obvious function in blood clotting, platelets are now considered to play a pivotal inflammatory role in the hardening of the arteries in the first place, and in allergies, rheumatoid arthritis, and even cancer. So counter to what many doctors have been saying, that is that diet is a minor consideration in disease prevention, it is what I and many thousands of people have been saying for a lot of years now. "You are what you eat". So stop consuming all the breads, pastas, crackers and other wheat products, reduce your sugar consumption, eat healthy fats (not vegetable oils or transfats), eliminate from your diet all processed foods, and eat lots of organic fruit and vegetables. Wash it down with filtered water...feel and look better...live a longer and healthier life. Unfortunately, it is not as simple as that. What the above study did not reveal is the devastating result of eating what appears to be (or what we expect to be) healthy fruit and vegetables that are raised from genetically modified seed (gene spliced with glyphosate) and then given another dose of the same pesticide before harvesting. Grains are some of the worst culprits (wheat, soy and corn) because they are ingredients in foods that are commonly consumed daily. Make no mistake. Thick skinned fruits such as oranges and lemons are probably not on thee list of GMO's, but leafy vegetables and many tubers, such as potatoes, are heavily dosed. Be warned, washing does not remove glyphosate or many other pesticides, because the plant absorbs toxins from the soil through the root system and contaminated water in the soil. Do not always believe what is on the front label of packaged, canned or jarred food. Often what it says on the front label is exposed as false on the list of ingredients or disguised with such names as natural flavors or scientific names we are not familiar with. The damage caused by these toxins is not obvious, but it shows it's face in ways that we don't normally connect with the food we eat. This is revealed in brain scans...neurological disorders such as anxiety, bipolar disease, Alzheimer's, depression, etc. Studies show that changing diets to non GMO and organic foods actually CURES many of these maladies. For years, Dr. Gerald Pollack had been doing research on muscles and how they contract, but it struck him as odd that the most common ideas about muscle contraction do not involve water, despite muscle tissue consisting of 99 percent water molecules. "So I became interested in water," Dr. Pollack says. "We've been doing research in my laboratory at the University of Washington for some 10 years now on water. The book that I wrote in 2001, it's called Cells, Gels, and the Engines of Life, talks about the role of water in cell biology. Water is absolutely central." Yet textbooks by and large completely ignore the presence of water in your organs, muscles and tissues. Dr. Pollack's book addresses this discrepancy and brings to the fore the role of water. "The central message of that book is that if you don't understand how water interacts with the components of the cell, you haven't a clue of how the cell works," he says. Interestingly enough, if you're like most people, you probably think we've got water all figured out. But according to Dr. Pollack, this is far from true. In fact, "those in the field know that it's absolutely not true. We haven't a clue how water works," he says. So here we are in 2011, and even now leading scientists like Dr. Pollack are just starting to pick at the tip of the iceberg in terms of understanding the foundational basis of water! "In our lab, we've been focusing mainly on water structure near interfaces. Your body, of course, is filled with interfaces. Inside the cell, it's mainly proteins, nucleic acids, and salts. They're all interfacing with water," Dr. Pollack says. "So the central question is: what happens when water interfaces with those constituents? Does it change? Does it remain the same? This is where we've made some important discoveries." Highlights of a Decade's Worth of Research into Water Dr. Pollack's research has uncovered some interesting surprises. "The chemistry book says, if you have a charged interface, or so-called hydrophilic (water-loving) interface (which most of the constituents in your cell are), the current view is that a few water molecules might actually line up and become ordered. But this is considered a secondary effect, -- not very important for understanding of how cells function. What we found is that instead of two or three molecular layers, the ordering of water can actually amount to a few million molecular layers. In other words, the water at interfaces can order in a macroscopic way. A really huge amount of this kind of water, and its properties are so different that it looks like a distinct phase of water." So, what does this mean, in terms of affecting human biology? If you think of the cell as a matrix of proteins, like a grid made up of proteins and nucleic acids, the spaces in between those grids are filled with water. This means there are a lot of surfaces that interact with water and impact its structure. Your cells consist mainly of this interfacial, or structured/ordered water, making it essential to understand this water in order to understand the workings of the cell. This is not a new idea. It's been known for years, although the information has largely fallen out of view and been forgotten. One of the pioneers in this area is a Chinese-American researcher Gilbert Ling, who wrote several books on the central importance of water in the cell. So, water is actually part of the structure of each cell. In addition to the fact that this water is interfacing and is ordered, it is also charged. And the water just beyond it is oppositely charged. This acts like a battery. Dr. Pollack explains: "In your cells are multiple batteries with plus and minus charges, separated... The question is; how are these batteries charged? The charge comes from incident radiant energy; light, heat, ultraviolet. All of these absorbed energies separate the charge. The energy that's coming in from outside builds this charge separation and order. This potential energy fills your cells. I think this energy is critical to an understanding of how your cells work." In a nutshell, the water in each of your cells achieves its ordered structure from energy obtained from the environment, typically in the form of electromagnetic radiation, including sunlight and infrared heat. Well...Did you know that Traditional Chinese Medicine refers to diabetes as the “thirst disease.” And according to the Cluster Biology Lab at the New Jersey Institute of Technology, “Proper hydration is critical for people with diabetes because water has to be organized around insulin - for every one insulin molecule, you need 440 water molecules.” Did you get that? 440 water molecules per ONE insulin molecule! That’s unbelievable... This is why it is so common for diabetics to be so perpetually thirsty. I think this is crucial information, diabetic or not, for everyone to know. And if you are unfamiliar with what insulin does, insulin is a very important hormone with a number of tasks but it’s most important role in the body is to bring blood sugar levels down. With western diet being what it is today, filled with sugar and starchy refined carbohydrates (which basically translates into sugar), people need to stay hydrated all the more to keep up with their insulin production. Unfortunately people have been led to believe that whole wheat is healthy, when in fact it’s actually one of the deadliest foods around. Its actually one of the leading causes of cardiovascular disease and diabetes today. Did you know that 1 slice of whole wheat bread raises blood sugar levels more than 1 tablespoon of white sugar. It even beats out sugar on the glycemic index scale; wheat scores a 75 and sugar a 59! If you’re unfamiliar with this glycemic index thing its basically how fast a food raises your blood sugar levels, the closer to 100 it scores, the worse it is for you. So next time you’re preparing a peanut butter and jelly sandwich for your child, skip the bread and just pour on some sugar, oddly enough that would be the healthier choice. With these constant high levels of blood sugar and the constant bounce from extreme high to low, the body becomes resistant to insulin resulting in the development of metabolic syndrome or type 2 diabetes. This is a serious problem today, about 30% of Americans are pre-diabetic and 9 out of 10 of that 30% don’t even know it. And guess what? I bet you can already guess where I’m going with this... Structured water! Yep, that crazy new H302 water I’ve been recently letting you in on. Recent clinical studies with diabetic patients reveal that the consumption of hexagonal water produced a trend towards lower levels of blood sugar in just 4 weeks. Check out the “Hexagonal Water - The Ultimate Solution” book we sent with your Adya order. There are some great testimonials in there from people with diabetes who cut their insulin medication in half! And in some cases... “Today, after six months. I returned from the doctor with normal blood sugar and I was told that I no longer needed any medication for diabetes”- Rhonda R., Texas USA Simply by drinking structured water! Okay, before I go, I will leave you with one last critical bit of diabetes diagnoses advice that I got from Dr. John Doulliard, Ayurvedic physician and director of the LifeSpa Ayurvedic Retreat Center in Boulder, Colorado, USA. Since 9 out of 10 of the 30% of pre-diabetic Americans don’t even know about their condition, here is an easy way to check: Take your blood sugar levels first thing in the morning with a glucometer. If your level reads 100 nanograms per milliliter, that level is considered a diagnoses for pre-diabetes. However, studies are beginning to show that arterial damage starts at blood sugar levels of 85. So if you score anywhere from 85 - 100, Dr. Doulliard labels this range as “pre, pre-diabetic” and strongly suggests you consider some dietary changes because you are damaging your arteries and are on a speedy path to developing diabetes. Actually, as it turns out, dehydration is at the root of a lot of chronic illness. As we age, our thirst mechanism deteriorates along with the rest of our body. We don't feel thirsty, but our body is in drastic need of hydration (clean filtered water...not tap water contaminated with chlorine and fluoride along with all the other nasty substances that come out of the tap). All of our organs, in order to function properly, must be sound at the molecular level and we should be able to reach that conclusion from a simple analysis of cell structure. Our bodies, right down to the cellular level, are mostly water. Dehydration is a problem for children, as well, because they are given so much soda pop and other sugary drinks. They are developing a fungal disease very early in life because "candida albicans" feeds on sweets. The resulting overgrowth of yeast soon takes over various parts of the body and weird symptoms appear, depending on where it settles in to feed. Asthma is one of the chronic ailments most common among youth, because parents indulge them with sweets. Dehydration then makes things worse. During the period of the Judges, A Danite named Manoah had a wife who was barren. An angel appeared to her and revealed that she would soon bear a son. He would be a Nazirite from birth (one devoted to God for a particular mission). The angel told her what terms were required for keeping a Nazirite vow. She had to be careful to keep herself and her son from "wine or similar drink, and not to eat anything unclean. And no razor shall come upon his head, for the child shall be a Nazirite to God from the womb; and he shall begin to deliver Israel out of the hand of the Philistines." (Judges 13:4-5, 7,14) Notice that Manoah's wife had to restrict her diet while pregnant, so that her son would be a Nazirite from birth. Of course we know that what nourishes the mother also nourishes the child, so, as stated, we are what we eat. (More biblical discussion at http://thebetterway.yolasite.com) Of course we know about Elizabeth, when visited by Mary, the child in her womb leaped at the sound of her voice. The old saying is absolutely true. Think about it. Just like when you put two relatively poisonous substances together...sodium and chloride, to make salt, the opposite is true. Everything that goes into our bodies alters it's chemical composition. Fortunately, God has designed our bodies to be able to absorb or neutralize a lot of toxins. Additionally, our bodies will warn us when something is chemically missing or out of balance. Unfortunately, our culture has trained us to misidentify bodily signals or treat them with a foreign substance. For example, if we wake up in t he morning with a headache, what do we do?...take an aspirin, right. Actually it may be that our bodies are simply telling us that we are dehydrated. Which is better for the body?...a glass of water or two aspirin or Tylenol or whatever you normally take. If this is actually the right explanation for the headache, then taking Tylenol is like putting water in your car's engine when the oil light comes on. It may make the light go out but it can damage the engine. Young people learn from their parents that this is the way to handle aches and pains. They come to believe that a certain amount of sickness is just part of life and that the doctor will fix them up with an antibiotic or a drug of some kind. They witness older people having all sorts of chronic pain and debilitating illness, but since they themselves are not suffering, it won't happen to them. The truth is that the human body is designed to take a lot of abuse, but there is a gathering burden that finally rears it's ugly head in the form of all kinds of hideous disease. So, what is the answer? It is to educate yourself. Observe and learn from your observations. Quit being so stupid as to believe you can continue to put garbage into your body without paying a price. Don't be so naive as to believe that you can ignore what your body is telling you, or that you can use some foreign substance that you know has nasty side effects to make things better. These substances do not cure, they mask. Don't trust anyone with your health. Use your head. Ask questions. In this day and time, there is no excuse for not researching your symptoms and the optimum way to treat the problem. Sure, doctors have a function. Use them when necessary, but prevention with healthy eating habits and exercise should be your first line of defense. Realize that the chemical composition of your body is altered with everything you eat and drink. It is not only what you eat, but how and when you eat it...and for every illness, their is also a natural explanation and a natural treatment. Our modern environment is so full of toxins and our food is so contaminated with chemicals, it is almost inevitable that we will get sick from time to time and need to begin some regimen of treatment. Be wise enough to realize the myriad of methods your body has to fight off illness, but be aware that a body already exposed to poor diet and unhealthy habits is not well equipped to defend itself. It must be supported. For example, doctors rightly tell you the best way to fight a cold is to drink lots of liquids and get plenty of rest, but there are many other things you can do to support the immune system. Ask yourself, ...How did my immune system get so weak as to allow the virus to take hold? Knowing that can help you to make lifestyle adjustments to begin the process of getting better. Also, be aware that allowing the immune system to overcome the illness is equal to, if not better than, a preventative vaccination. It allows the body to develop antibodies that arms the immune system for it's next viral confrontation. Refined Sugar Alternatives...The healthiest form of sugar is from whole foods such as fruits and vegetables. These whole-food sugars also come with micronutrients known as fiber, enzymes, complete vitamins, organic minerals, antioxidants and phytochemicals. Both scientific literature and clinical experience show that diets high in fiber, fruits, vegetables and herbal teas significantly reduce the occurrence of a host of deadly diseases. (HFCS) containing from 55-90% fructose, is dangerous for your health for two significant reasons. Fructose converts quickly to stored fat. Secondly, nearly all corn syrup is genetically modified. Sugar Alcohols—sorbitol, mannitol and xylitol, erythritol and oligosaccharides (wood sugar or birch sugar). See the article below on xylitol. Rice Syrup—from rice and sprouted grains (maltose being the main sugar type). Fruit Juice Concentrate—remaining sugar from apples, devoid of most of its fiber, enzymes, vitamins and minerals...poorest quality juice. Date or Kiwi Sugar—made from dehydrated ground dates or kiwis. Unsulphured Molasses—made from the juice of sun-ripened cane, blackstrap molasses is the residue of the cane syrup after the sugar crystals have been separated. Sucanat—non-refined cane sugar that hasn’t had the molasses removed from it. Rapadura—essentially pure dried sugarcane juice much like sucanat. Raw Honey—made by bees and typically only sold in health food stores or at farmer's markets, because it has not been pasteurized. I would add 1 more item to this list. It is organic coconut palm sugar. It's glycemic index is 35 compared to 98 for some processed white sugar. Cane sugars are GI 68. The glycemic index is from 1-100 with pure glucose at 100%. Also most sugar made from beets is genetically modified, so if you are concerned about your health, by all means, stay away from beet sugar! Some people have reported abdominal cramps and dihorrea from using xylitol, but the problem may have resulted form the manufacturer mixing sorbotol with xylitol. There have also been some reports of xylitol having toxic effects on pets. Our bodies naturally produce about 15 grams a day of xylitol, so certainly doses that size or less could not be responsible. Genetically Modified Foods (GMF or GMO'S) It is not an accident that many of the links found on this page will not work. Numerous organizations are blocking the truth about this topic. According to the FDA and the United States Department of Agriculture (USDA), there are over 40 plant varieties that have completed all of the federal requirements for commercialization. ( http://agbioforum.org/v3n4/v3n4a15-belson.htm) Some examples of these plants include tomatoes and cantelopes that have modified ripening characteristics, soybeans and sugar beets that are resistant to herbicides, and corn and cotton plants with increased resistance to insect pests. Not all these products are available in supermarkets yet; however, the prevalence of GM foods in U.S. grocery stores is more widespread than is commonly thought. While there are very, very few genetically-modified whole fruits and vegetables available on produce stands, highly processed foods, such as vegetable oils or breakfast cereals, most likely now contain a large percentage of genetically-modified ingredients because the raw ingredients have been pooled into one processing stream from many different sources. Also, the ubiquity of soybean derivatives as food additives in the modern American diet virtually ensures that all U.S. consumers have been exposed to GM food products. Allergenicity Many children in the US and Europe have developed life-threatening allergies to peanuts and other foods. There is a possibility that introducing a gene into a plant may create a new allergen or cause an allergic reaction in susceptible individuals. A proposal to incorporate a gene from Brazil nuts into soybeans was abandoned because of the fear of causing unexpected allergic reactions31. Extensive testing of GM foods may be required to avoid the possibility of harm to consumers with food allergies. Labeling of GM foods and food products will acquire new importance, which I shall discuss later. Unknown effects on human health There is a growing concern that introducing foreign genes into food plants may have an unexpected and negative impact on human health. A recent article published in Lancet examined the effects of GM potatoes on the digestive tract in rats. This study claimed that there were appreciable differences in the intestines of rats fed GM potatoes and rats fed unmodified potatoes. Yet critics say that this paper, like the monarch butterfly data, is flawed and does not hold up to scientific scrutiny. Moreover, the gene introduced into the potatoes was a snowdrop flower lectin, a substance known to be toxic to mammals. The scientists who created this variety of potato chose to use the lectin gene simply to test the methodology, and these potatoes were never intended for human or animal consumption. Cases of oral allergies to fruit and vegetables are rapidly increasing, according to a specialist. Dr. Pamela Ewan, an allergy consultant at Addenbrooke's Hospital in Cambridge, England, said the rise in cases appears to be outstripping even peanut allergies. Dr. Ewan, who sees more than 8,000 people with allergies a year, said that most patients with reactions to fruit and vegetables were youngsters. Symptoms can include swelling in the mouth and throat, and breathing difficulties. One 2006 study published in the medical journal Thorax found a 400 percent increase in hospitalizations due to food allergies in the UK since 1990, and admissions for anaphylaxis had increased by 600 percent. Some of the most allergenic foods include pasteurized milk, soy, and wheat (gluten), but fruit and vegetable allergies are on the rise and now rival peanuts in terms of allergic reactions. According to Dr Adam Fox, a consultant pediatric allergist at Guy's and St Thomas' Hospital in London, there appears to be a cross-reactivity between the proteins in pollen, such as birch, and certain fruits, such as apples and pears. So if you’re allergic to pollen, you may be more prone to develop allergies to certain foods as well. 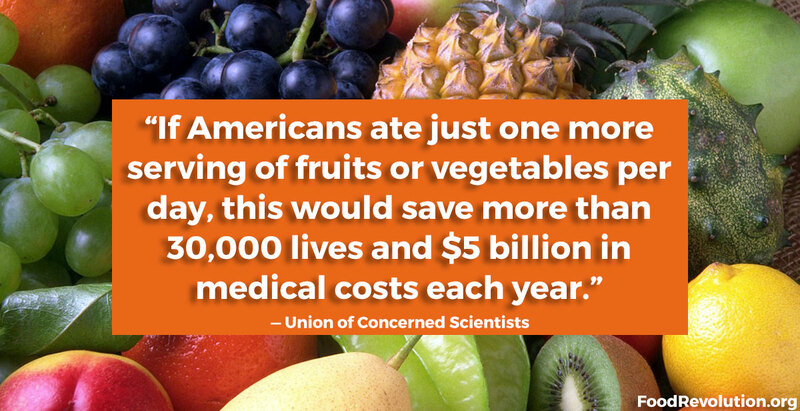 Another possibility is the increase in genetically modified fruits and vegetables. No one knows the full extent of what happens to the end product when you splice in new genes, and then eat that product for several years, or generations. One thing we do know is that between 1994 and 2001 -- the same time that GMO’s flooded the market – food related illnesses DOUBLED. GMO’s may also create brand new diseases that we’ve never seen before, in addition to spurring on the disease rate of some we already have, such as cancer. Specialists are also reporting a significant rise in the number of people suffering from several allergies at once. Allergic symptoms are also becoming more severe, causing acute pain, and in some cases even death. In another recent BBC article, Dr. Jonathan North, a consultant immunologist in Birmingham, stated that allergy cases in the UK have risen from 15 percent of the population to closer to 40 percent. In the U.S., an estimated 55 percent of the population test positive to one or more allergens! Many specialists believe the rise in eczema is a significant contributing factor to the allergy epidemic – a sort of “gateway” that can enable other allergies to develop. The broken, scaly skin that is a major symptom of eczema can allow other allergens to enter your body, prompting your immune system to react to it as an enemy invader. However, eczema can also be caused by food allergies, so if you suffer from eczema, you may also have a hidden food allergy or sensitivity. For simple, effective strategies that can help you get this common skin condition under control, please review my recent article on this topic. Airborne fungal spores released from mold, which are common in the air you breathe daily, can also increase your risk of multiple allergies according to a study by University of Cincinnati researchers. Since molds can grow on any moist surface in your home, the high humidity of the summer season signals increased mold growth, and potentially more health problems for your entire family. Along with obvious places such as shower stalls, air conditioners and damp basements, there can be many hidden sources of mold in your home. Particularly if you have had plumbing problems or leaks in your roof, mold may grow and release spores from places such as drywall, carpet or padding, even wood. Mold spores are very difficult to destroy, even with cleaning agents such as hot water or bleach (which is itself toxic). The best way to reduce the problem is through smart preventive measures. Hands-down, the most effective and simple overall solution to fight all the sources of mold in your home is to use a superior-quality air purifier. If you discover mold growth in your home, there is a natural substance that destroys all species of mold, without endangering your family or pets. It is a combination of essential oils called "Thieves"...so named because the formula was used in Europe when it was discovered and used by grave robbers during the black plague in the middle ages. It is produced naturally from plants by Young Living Corp. .
One of the easiest and most powerful actions you can take if you believe you are suffering from a food allergy is to do a diet elimination challenge. Simply remove all foods that contain what you believe you are allergic to and see if your symptoms improve over the next few days. You may need to go as long as five days to give it a full trial. If the symptoms disappear in one day, of course you have your answer. The real clincher, though, is to reintroduce the food or drink (on an empty stomach). If the suspected food is the culprit you will generally be able to feel the symptoms return within an hour. This can be difficult if you eat a lot of processed foods, as these often contain "hidden" ingredients like corn, milk, soy, wheat, yeast and artificial additives that are often problematic. The most suspect foods will be those eaten daily or more than once a week, as well as foods that you crave or eat at night. In extreme cases where it is difficult to isolate the offending food, you may even need to go on a fast to see if your symptoms resolve. Fasting has a cleansing effect. Remember, you can also be sensitive to food additives like artificial colors, preservatives and flavor enhancers (MSG), so avoiding all processed foods can also help. And, although the jury is still out on the health effects of cloned foods, I am willing to bet they’re not without ramifications. It’s important to realize that if you don't take measures to address your food allergies, you can end up with permanent, long-term damage. Allergies can put constant and unnecessary stress on your immune system that will weaken it over time, possibly leading to chronic or degenerative disease. Once you’ve identified the foods you are allergic to, you will want to avoid them as much as possible. Your symptoms will likely disappear or improve once you reduce your exposure. In terms of food sensitivities, a comprehensive nutritional approach is vital, and most people's sensitivities dramatically improve when they follow my nutrition plan. This includes avoiding sugar, all processed foods, fruit juices, most grains, pasteurized dairy products, and wheat gluten. Last year a laboratory study was published in Nature showing that pollen from B.t. corn caused high mortality rates in monarch butterfly caterpillars. Monarch caterpillars consume milkweed plants, not corn, but the fear is that if pollen from B.t. corn is blown by the wind onto milkweed plants in neighboring fields, the caterpillars could eat the pollen and perish. Although the Nature study was not conducted under natural field conditions, the results seemed to support this viewpoint. Unfortunately, B.t. toxins kill many species of insect larvae indiscriminately; it is not possible to design a B.t. toxin that would only kill crop-damaging pests and remain harmless to all other insects. This study is being reexamined by the USDA, the U.S. Environmental Protection Agency (EPA) and other non-government research groups, and preliminary data from new studies suggests that the original study may have been flawed. This topic is the subject of acrimonious debate, and both sides of the argument are defending their data vigorously. Currently, there is no agreement about the results of these studies, and the potential risk of harm to non-target organisms will need to be evaluated further. Reduced effectiveness of pesticides Just as some populations of mosquitoes developed resistance to the now-banned pesticide DDT, many people are concerned that insects will become resistant to B.t. or other crops that have been genetically-modified to produce their own pesticides. Gene transfer to non-target species Another concern is that crop plants engineered for herbicide tolerance and weeds will cross-breed, resulting in the transfer of the herbicide resistance genes from the crops into the weeds. These "superweeds" would then be herbicide tolerant as well. Other introduced genes may cross over into non-modified crops planted next to GM crops. The possibility of interbreeding is shown by the defense of farmers against lawsuits filed by Monsanto. The company has filed patent infringement lawsuits against farmers who may have harvested GM crops. Monsanto claims that the farmers obtained Monsanto-licensed GM seeds from an unknown source and did not pay royalties to Monsanto. The farmers claim that their unmodified crops were cross-pollinated from someone else's GM crops planted a field or two away. More investigation is needed to resolve this issue. The tables have now turned on Monsanto. Farmers attempting to grow non GMO crops have had their fields contaminated by wind-born pollen from nearby GM field crops and suffered financial loss as a result. The public is now clamoring for non GMO grain and will pay more for it, because of newer information that GM food crops can have negative health consequences. This results in brand new proteins that have never before existed in food, some of which may be causing severe allergic reactions. God created our bodies to assimilate and make use of natural foods. What happens to foods the body does not recognize? • Several US farmers reported sterility or fertility problems among pigs and cows fed GM corn varieties. Tip: By-the-way...If you need a solution for your dry, parched hair, try this combination from Justin Despasquale from The Spa in New Jersey. Mix together ¼ cup of club soda, ¼ cup fresh-squeezed grapefruit juice, ¼ cup fresh-squeezed orange juice, ¼ cup fresh-squeezed lemon juice and a drop of sage oil. Spray onto wet hair and leave for two to four minutes. Shampoo and condition your hair as normal. The acid of the juices and the carbonation of the soda are sure to rinse dirt, chlorine and salt build-up and leave behind healthy, shiny hair!